Horrible setup to one of the greatest wrestling finishers; I will always call it the ‘Diamond Cutter’… BANG! 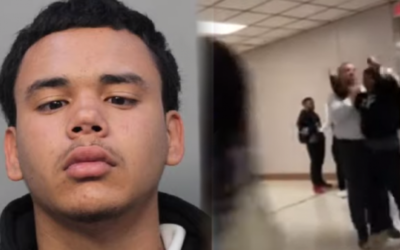 18-year-old Gianny Sosa, of Miami Southridge Senior High School, was arrested on Wednesday for attempting to RKO his principle. For the setup, little Gianny deserves a Saturday dentition at best, not an entire trip to jail. “Cellphone video of the altercation shows Sosa placing his arm around the principal’s neck before the principal gets the student in a chokehold and appears to throw a punch at him.